Collector Spotlight ~ Spirited Celeste! Bring on the Holiday Cheer as Christmas is ever so near! 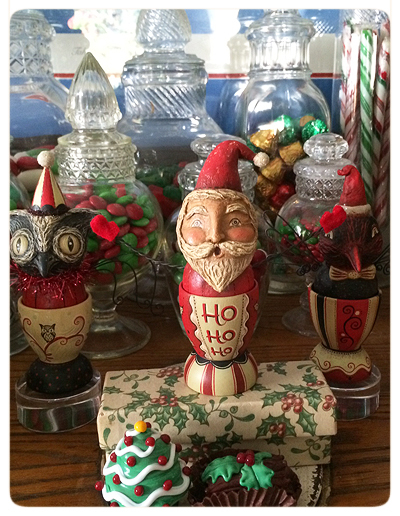 It is my honor and treat to share with you a festive Collector Spotlight. 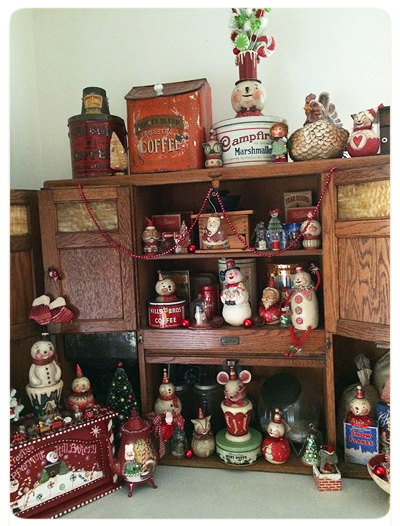 My dear collector friend Celeste, who shares a love for all things holiday, has once again opened her cozy home to us! After she artfully arranged her holiday displays this December, she snapped a medley of photos for me to share with you! Celeste has been collecting my folk art for several years, and her cupboards and sideboards show the results of her passion. Amongst the art of others, I am honored to have such a special spot in her home! Not only does she revere my winter-themed characters, but she also has a weakness for my Halloween as seen in her original Collector Spotlight feature! We've connected several times at shows and at our open house, and it is the twinkle in her eyes and the joy in her smile that really resonates with me when she sees my latest creations. I love that my creativity can ignite a wonderment and inspire her imagination. As always, it is a joy for me to see my handmade creations delighting others and filling homes with good cheer. Thank you Celeste for welcoming us into your decorated home, and I appreciate that you have found a special place in your heart for my art! For those that have joined us, read along for a fun Q & A as you peruse Celeste's photos! ENJOY! 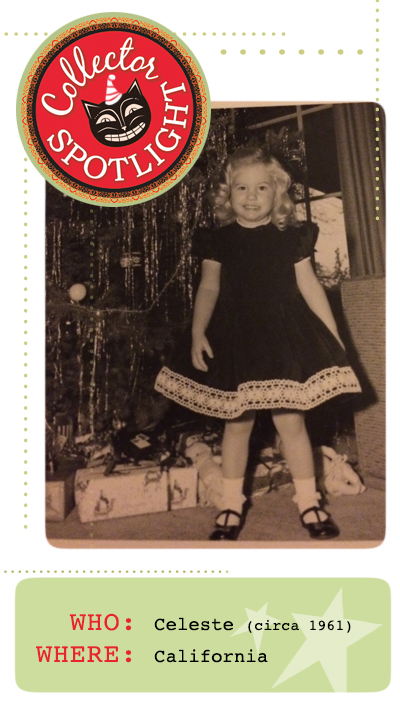 * Celeste's excitement for the holidays has a long history… I love her perky dress and curly locks as the tinsel shimmers on the Christmas tree! * A prominent piece for displaying treasures in Celeste's home is her antique Sellers Hoosier hutch, or "The Better Kitchen Cabinet" as the vintage tag plate states. I agree, it's the perfect spot to showcase a medley of finds, both old and new! 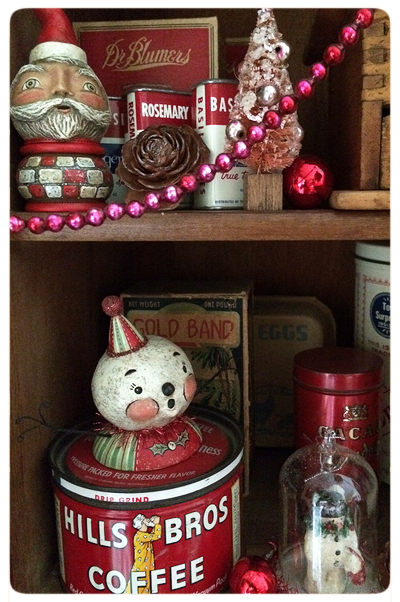 From the top to the counter and the shelves in between, she fills the nooks with holiday cheer. A clever blending of antique finds pair perfectly with the folk art characters that call this piece home. Johanna: How did you learn about my holiday folk art? Celeste: I first saw you at Halloween and Vine seven years ago, and when I found your booth, I had already spent all my money!! I was so sad..I brought my friend Mona over to your booth and said, look how cute these pieces are!!! Buy one, so at least I can see it at your house! So she bought "Dixie Dot"! Your web update was not long after that and I was so anxious, I was an hour early for it, I forgot about the time change!! I was able to get my first one that day, "Bailey Boo". Johanna: Oh my, I still remember that email that you sent me an hour early before the sale! I'm so glad you snatched something special, and wow did that ever blossom into something special! 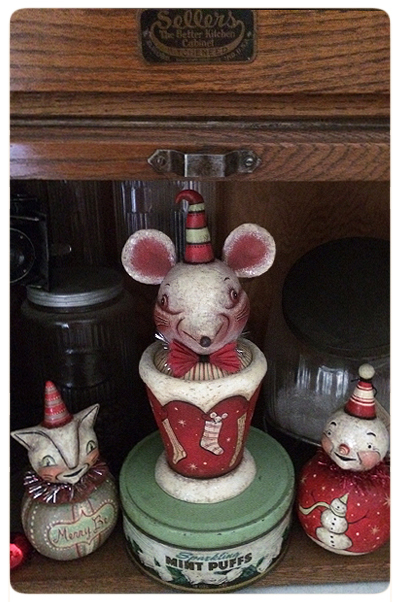 * At center is an original mouse candy container, one of Celeste's favorite pieces. He's donned with painted stockings and perches atop an old Sparking Mint Puffs tin. (I too have this vintage tin in my collection!) An original cat ball and a snowman ball character surround the scene. Vintage glass sugar jars add a touch of nostalgia and a baker's delight feel. Holiday originals by Johanna Parker Design. * Above, one of my original kettle cup snowmen whistles a holiday tune! Celeste tucks him in with old boxes and tins. 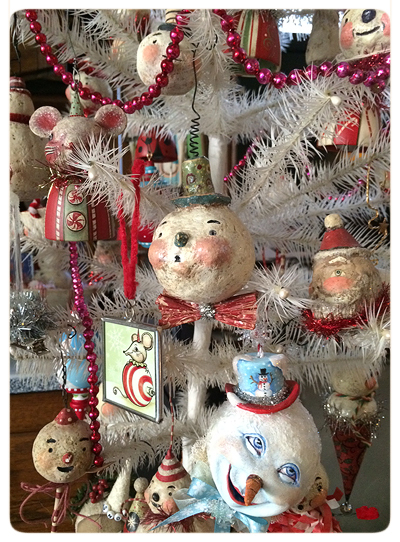 A sweet vintage style tree and other novelties complete the nostalgic scene. Johanna: Time sure flies! I was just thinking today that I have been making my folk art, full time for over ten years now. Crazy! * Below, we take a closer look at my snowman ball character, snuggling up to that sweet green tin. Under a delicate glass dome, a vintage Christmas tree twinkles. * Off to the side, a pair of holiday ball character originals pose for their photo! 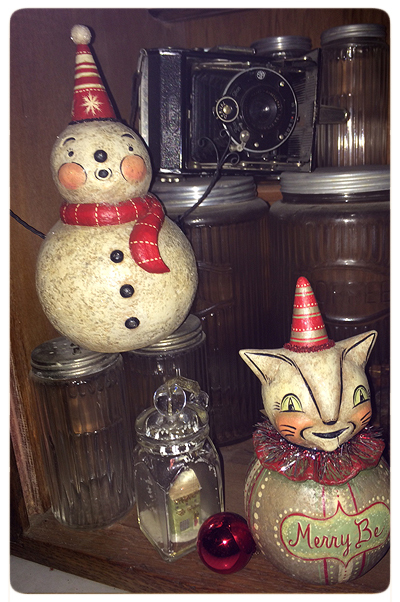 As the snowman balances on a pair of antique glass shakers, a vintage camera sets the scene from behind. "Merry Be"says the cat! Holiday originals by Johanna Parker Design. Celeste: I love antiques and vintage things and I feel your pieces remind me of vintage holidays, say the 40's era. The hues you use are so rich and the expressions are so cute and whimsical, I truly love them. Johanna: Ahh, you nailed it! I love that era too. Whether intentional or not, the style and flowing lines of the 30s and 40s decades just seep out of me when I create. * A white feather tree adds texture, twinkle and delight to the scene. Celeste has been collecting my ornaments, both originals and reproductions for several years now, and her treasure hunting has proven fruitful. 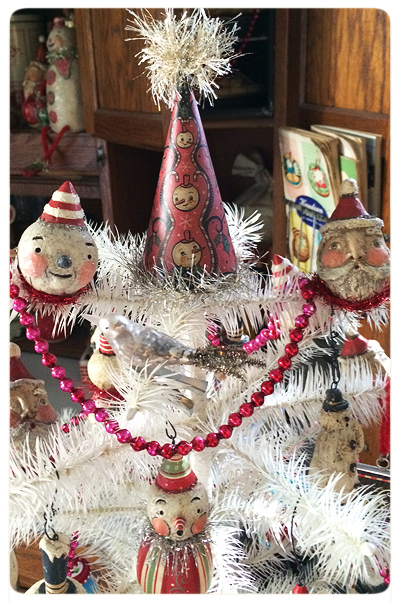 One of my illustrated snowman hats cleverly crowns the top of her tree! Below, holiday characters clip and dangle from branches. She has been collecting my one of a kind bell ornaments for several years now and has acquired a hearty handful of these jinglers! Off in the distance, I spy a snowman sitter…. Let's take a closer look! 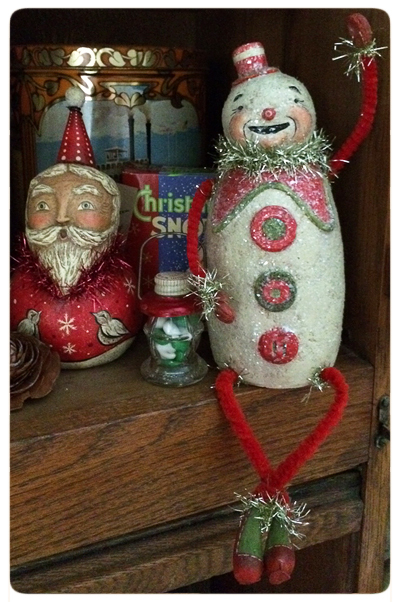 * Back at the hutch, this very limited edition snowman sitter from my Bethany Lowe Designs line waves a happy hello, while an original Santa ball character hails a "ho ho ho!" Christmas characters by Johanna Parker Design. * More ornaments dangle in delight and spread good cheer. 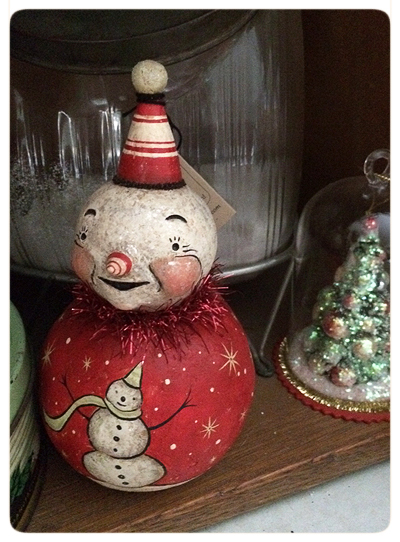 In the mix, a jolly snowman with carrot nose (bottom right) from artist Tammy Strum joins in on the fun! More characters, both original and reproductions by Johanna Parker Design are sprinkled in for a festive mix! 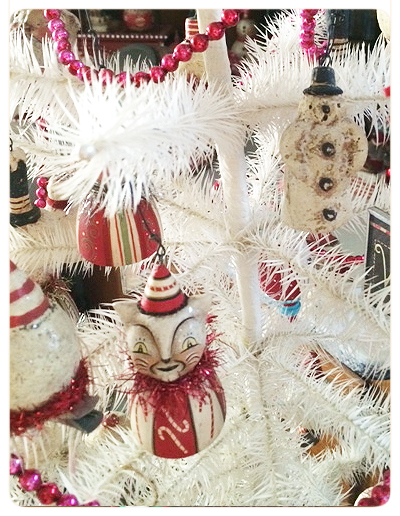 * As you take a stroll around the tree, more treasures peek through the branches including the two snowmen in red stocking and cone by Johanna Parker Design along with a whimsical snow-cone combo by artist Robert Brawley. Johanna: That would make sense… I should call you "Speedy Celeste" with those fast fingers! 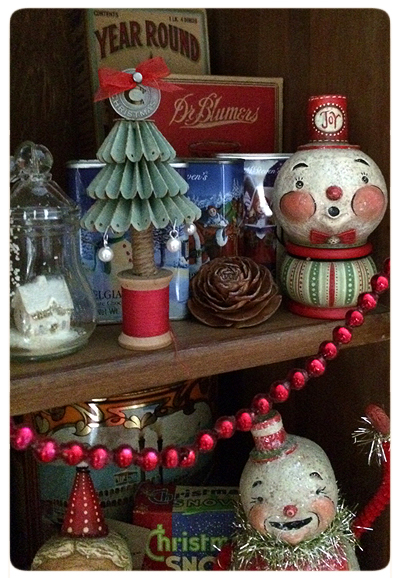 * A cabinet cubby calls Christmas with more Johanna Parker Design snowmen! 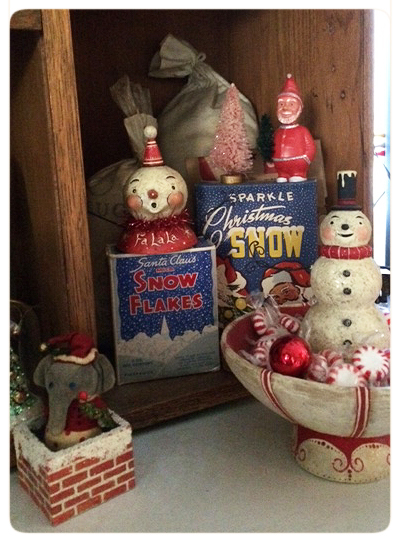 Vintage style snow flake boxes are used for both holiday sentiment and perching posts. A sweet elephant Santa peeks out of a chimney by Jody Battaglia. 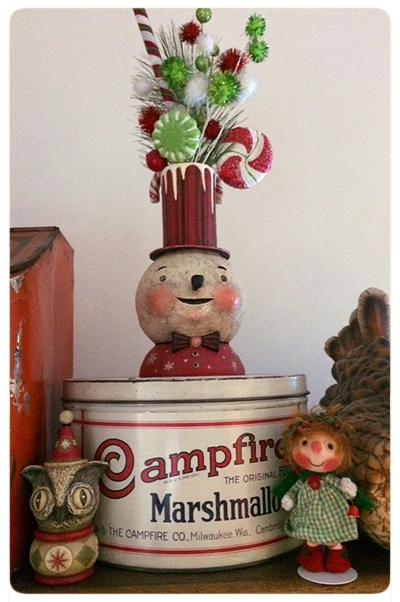 * Old coffee and spice tins add a tasteful touch to the holiday scene where both my Santa kettle cup and snowman bust settle. 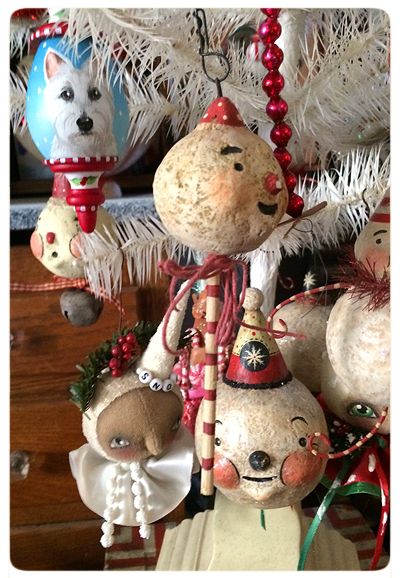 Vintage glass beads, old baubles and a bottlebrush tree add holiday shimmer. 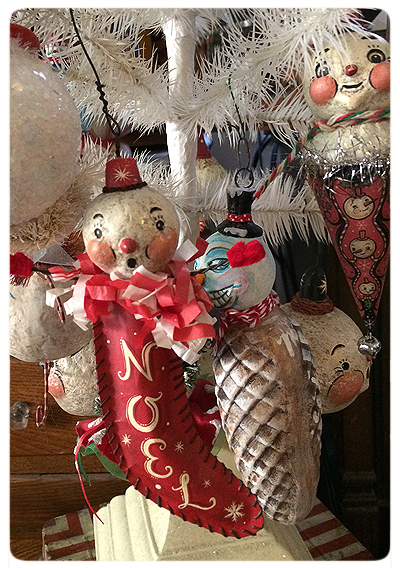 * More antique novelties and an old coffee grinder set the stage for a reproduction Santa ornament from my Bethany Lowe Designs line and a jolly sweet snowman holding snow babies, an original by artist Tammy Strum. * Up top, a limited edition snowman vase from my Bethany Lowe Designs line, bursts with a spray of shiny holiday cheer. An original owl kettle cup by Johanna Parker Design nestles amongst the antique tins and a sweet holly angel by Jody Battaglia adds balance to the arrangement. * Towering "Icicle Ike," one of Celeste's most recent acquisitions, is one of her faves! He proudly perches next to a very special vintage 60s tree created by Vivian Parsons, Celeste's mother now in spirit. A smaller snowman ball character offers a sweet grin while a little holiday train carrying critters frames the scene. 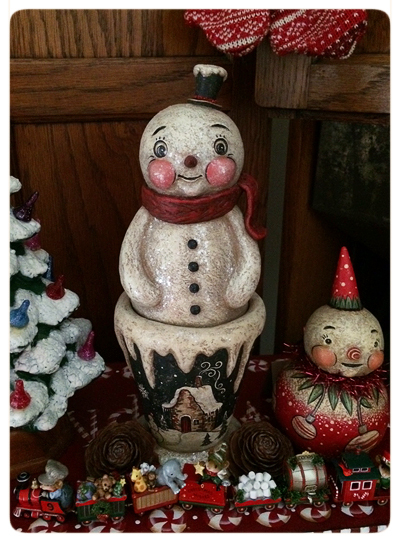 Both snowman originals are by Johanna Parker Design. Johanna: Do you have a favorite piece in your Christmas collection? Johanna: Oh, I know it's almost impossible to choose a fave. I would have guessed egg cups for you too as I know how much you love those :) "Koo Koo" is appropriate in a fun egg-cup kinda way! * Speaking of Egg Cups….. Look at the large family of characters that Celeste has been adopting over the years! In mass, they make quite the festive statement. I spy eleven little characters in cups with arms spread wide! In the background, the "'Take out Window" painted by the late Charles Wysocki, sets a magical winter scene while Wee Forest Folk ornaments dangle from a tree. * A closer look reveals sweet little faces with bright eyes and delicate details. A row of beautiful general store style candy jars add a sweet touch, and some are filled with glass candy by Hulet & Hulet. Johanna: Is there anything in particular you suggest I try making in the future? Celeste: I would love for you to try making Halloween bell ornaments as well as a squirrel and a raccoon! Johanna: All would be fun, and thanks for the suggestions! I'm still on the hunt for spooky-sounding jingle bells for Halloween. If anyone has a source for me, please let me know! 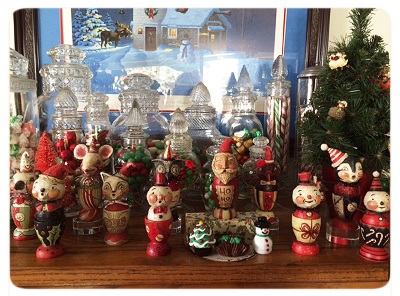 * Across the way, Celeste has festooned her mantel with holiday finds created by doll maker artisans. The standing Santa Cat designed by artist Mark Roberts is quite a festive statement piece and reminds Celeste of her mischievous cat Millie! But, I imagine (from what I've heard) that Millie would not tolerate to wear that Santa outfit :) A sheer mantel dressing drapes over the edge and draws the eye to a pair of cute snow folk by an unknown artist. * Back at the tree, more delights capture Celeste's heart including a hand-painted dog ornament by Carolee Clark (top left) and a sweet cloth angel by Robin Armstrong Seeber (bottom left). Snowman medley by Johanna Parker Design. I hope you enjoyed the Q & A as well as the holiday glimpse into Celeste's cozy home for Christmas! Many thanks again to Celeste for opening her home to us! It is a joy to have this chance to visit my creations through the lens of her camera, and I am pleased to see how carefully arranged and cherished my art is in her home. My wish is that my handmade characters continue to bring twinkle and delight to her eyes and smiles to those that enter her dwelling. To leave a message for Celeste or myself, please click on the "comments" link at the bottom of this post. Thank you!